Does this photo remind you of your childhood or a bad relationship? We all have heard the saying “sticks and stones will break my bones but names will never hurt you”. Even as a kid I knew it wasn’t true on some level but I wasn’t sure why. I grew up in a home where you didn’t challenge your parents. I didn’t have a voice in the family and I never was allowed to defend myself. My parents favorite saying was “children should be seen but not heard” and “I’ll beat you into next week”. So I didn’t while one level I went along believing they were right, on another (and mostly ignored level) I knew differently. The truth is I was too afraid to challenge them and think for myself. After all I was little. When you hear the same horrible things everyday you start to believe what is being said. I know there are a lot of other people who have faced much worse than me. So I don’t mean to be dramatic or belittle anyone. 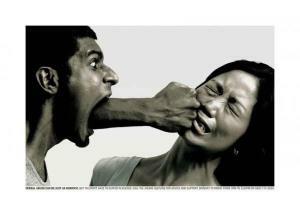 My experience in the home was one of both verbal abuse and physical abuse. But it was the verbal stuff that was hardest to handle. I never quite understood how my parents could be screaming at me one minute and then in the next moment say “Hey let’s go for ice cream”. When you’re young, you think all families are like this. In those days kids didn’t have sleepover. Every child slept at home in their own bed. So I didn’t have anything else to compare my family to. This was to be the start of a journey toward healing and a passion for counseling. As time went on, I did lay things down at the cross. I would just sit and listen to my heart. Whatever would be going on in my head and heart I would allow God to speak into it. Fortunately I was also married to one of the most kind-hearted, patient men in all the world. He never spoke to me the way my dad did. His patience facilitated healing. I was lucky or blessed because I didn’t marry a guy like my dad and have to keep reliving the verbal or physical abuse. Even more than that, together we broke the cycle of abuse with our children by not putting them down all the time or beating them. Instead we gave our kids what we needed when we were kids. Glad you have been able to heal those wounds. I’ve yet to have a healthy romantic relationship but know that I am now finally healed enough to do that. You were lucky to have such a wonderful husband to support you. I’m still learning how to set boundaries and not allow others to abuse me verbally. I’m getting much better at it. Setting boundaries got easier for me as I let God touch those places in my heart that desperately needed love. I can only hope He touched you in similar ways too! Thank you! It has been a lifelong spiritual and conscious focus of mine to do and allow this healing. I don’t believe it is only about healing US in the places that need love, I feel it is yes, about healing our own self worth but it is also a skill set of setting boundaries and not allowing others to act in abusive ways, learning healthy communication and conflict resolution skills. The problem is US inviting that kind of behavior, it is also abusive people learning that it isn’t acceptable to act this way and heal their behavior and their insecurities and darkness that strikes out in this way. And I feel it is us learning more discernment to not end up in these situations in the first place, too. I think most of us give what we ourselves need. Hmmm maybe that why the broken and bruised become counselors! Thank you so much! It’s all God!!! I had a chance to read the rules and more important I love the way you structured yours! Your pretty good at this. I hope I can do you proud! I’m sure you’ll do fine. It took me several days to get my post together. Some people just accept the nomination and choose to not jump through the hoops to acknowledge it and send it on, …kind of like a chain letter huh?! Others create an award page, just listing awards they are nominated for and linking to the blog that nomiinated them. So it seems there are many ways to handle it. I just wanted you to know that I value your blog, your honesty, your willingness to be vulnerable. Wow! I’m humbled. Thanks for sharing that it took you a few days. It will for me too. Just looked at your award blog and you did a great job. Only thing I’d recommend doing is create links so people can click on the name of the blog and it will take them directly to that blog. I thought at least my blog link would have shown up a link in your blog but it didn’t. To create a link (i just learned for my post), you highlight the name of the blog, then scroll up and on the task bar of your post, you click on “link” and a box will come up. In the top row you type the web address Ie: http://empowerandbalance.wordpress.com (this is what took me awhile, to look up all the web addresses). Then you can put the blog name in the second box and then I clicked the box “open link in new window”. I loved learning more about you! I will turn 63 in August. I miss having kids at home, too. Wow I would’ve never guessed you are older than me. I you seem so young. Maybe that’s cause you’re young at heart! Thanks for the tips on linking. I’ll give it a try in the next day or so. I’m going to visit my mom in Fla this weekend for a few days. If I don’t get to it all before Friday then for sure over the weekend. When I do this should it still be with I the post? Take your time and get around to it if and when you choose. Yes, you would do it within the post. You’d click on edit your post and then you’d go back to each of the blogs you recommended and nominated, type out the title of their blog, then go through the process to create links for each one. What this accomplishes is then making it easy for others to click on the links and check out all these wonderful blogs you’ve recommended, rather than having to go search on wordpress for each one of these. On my list, I have a blog that isn’t even on wordpress. You can go back to my post on the nomination and notice that Zak’s blog is linked, the one who nominated me, and each of the 16 blogs I nominated, including yours, is set up so when someone clicks on the title of the blog, they are immediately opened to the blog in another window. Oh..you can use linking in your own blog when you want to reference another blog post of yours that relates to the one you are writing, perhaps a book or related blog elsewhere, etc. I can relate very well. I did not realise how unhealthy some aspects of my childhood were until I had my own children. It has been very painful and the pain is not over yet. Unfortunately I can’t say I have broken the cycle completely with my children. We’re getting there. I can see that God is working. It seems the path to healing is to find our identity in Christ, and to look to our Heavenly Father for acceptance and approval rather than anyone else. Bless you for your honesty and I pray that God will work through you to help many people, both via your blog and in your daily life. Just keep listening to what’s rolling around in your heart and mind. The offer those part to God. He will pour in truth that heals. Thanks for the comment about honesty. I strive to communicate in a way others can identify with. My hope is that it will allows others to come out of hiding too. My parents were raised in the 30’s and brought their parent’s philosophy into mine and my sibling’s upbringing. My grandparents were loving but very rigid rule oriented people. Parents and grandparents alike believed very strongly that children should be seen and not heard. They repeated that mantra everytime my mouth opened and more than one adult was in the room. We were held accountable, expected to act responsible and use good judgement. Violation of rules was swiftly and harshly dealt with. It made me a better adult, a successful soldier, but stole my voice and sense of self. I was never a child, except in my imagination. My grand children allow me to be a child again with them. We’re the same, I’m just bigger and less energetic. we share the same kind of background.